This is a review for the supplement MentalBright. 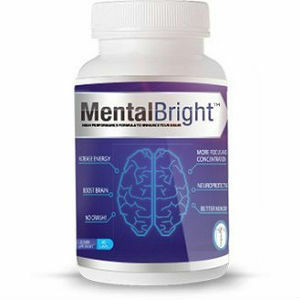 The manufacturer claims that MentalBright will enhance your memory, increase focus, increase clarity, increase concentration and provide neuroprotection. Read on to learn more about MentalBright and how it can improve the health of your brain. Caffeine– works to stimulate the central nervous system in order to encourage focus, awareness, cognition, and boost your mood. Alpha Gpc – Assists in producing acetycholine, which increases memory, cognitive function and attention. Choline Bitartrate- Helps to increase of cerebral metabolism, which promotes clear thinking, neuroprotection, and boosts memory. Huperzine A– Helps to break down acetylcholine, which contributes to the high performance of cognitive operations, memory and attention. Please note- It is a free of dairy, soy, gluten and nuts, but the capsules are not vegetarian or vegan because they are are made of gelatin. Additional ingredients were not listed. The site recommended that the instructions on the bottle be followed. It suggests that two capsules, which equal one dose, be taken in the morning with food. For best results, it is recommended that one to two doses be taken per day. Each bottle contains 60 capsules. The manufacturer claims that there are no side effects, but it has been recommended that people who are taking prescription medication consult with their doctor before taking MentalBright. This product costs $42.95 on the company website. The cost for two bottles, which is a 2-month supply, costs $79.99. Shoppers can sign up for the monthly subscription plan and pay $38.66 a month if they wish to receive a fresh supply of MentalBright every month. The manufacturer of this product offers a 110% Money Back Guarantee if the shopper returns product within 2-months of their purchase. The site recommends that buyers use the product for at least two weeks before attempting to return. Based on the customer reviews, which were all positive, people may not return the product if they do give it the two weeks needed to start working properly. MentalBright claims to improve your mental acuity and positively affect your memory. With the guarantee offered by the manufacturer, users will have a considerable amount of time to test out the product and decide if they will return it or continue usage. In comparison to most guarantees, this one is generous, as it offers more than 30 days to try the product. The price is affordable for everyone, even those who don’t have the subscription. There is only a small difference in price for those who get a monthly subscription, which is not much encouragement for people to consider signing up. It may also be an issue for some that this product is not vegan or vegetarian, however it is a dairy-free, soy-free, gluten-free and nut-free product. If you give the product the two weeks recommended to work it seems that this product could do what it claims as far as improving your brain function and memory. Henry Costa	reviewed Mental Bright	on June 22nd	 and gave it a rating of 4.